o kur dar geltonas povandeninis laivas …. 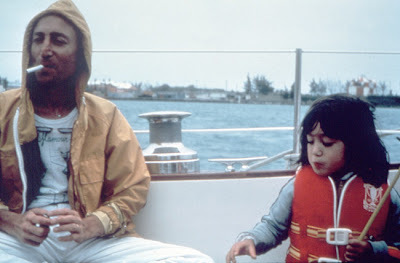 John Lennon had always had a secret desire to sail the Atlantic. After his return from Cape Town, where at Yoko’s behest, he underwent a course in psychic alignment for making a journey, he chose one that would eventually put him under considerable risk. The African oracle had told him that he could sail the Atlantic safely, but the only in a southeast direction. This meant that his destination could only be Bermuda. Yoko was always extremely concerned for John’s safety, always thinking that something dreadful would happen if he was set free. 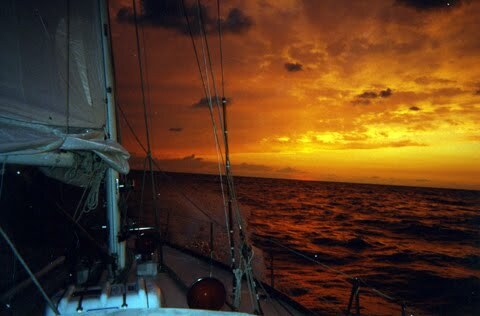 Despite the fovorable omens, she worried as John prepared himself to sail the Atlantic ocean in a 40ft boat with an unknown crew, past stormy Cape Hatteras, across the dangerous Gulf Steam, and into the Bermuda Triangle. On the morning of the 4 June 1980, a burly, bearded man known as Captain Hank, prepared the “Megan Jaye”, a 43-foot Hinckley centreboard sloop out of Newport, Rhode Island. for the offshore passage to Bermuda. About that same time, John left for Newport, Rhode Island aboad a Cessna with Tyler Coneys and his cousins, Ellen and Kevin, who were to be additional members of the crew. It hadn’t been since he traveled to Hamburg in a mini-van with Alan William, that he had ventured such an exciting leap into the unknown. Soon he would be alone among strangers in a wild sea, taking a risk that he had spent his whole life avoiding. He was about to fulfill his most cherished childhood fantasy—his great dream of going off to sea just as his father and grandfather had done before him. What happened next was, poetically speaking, inevitable. The little sailing vessel ran into stormy seas and eventually a tempest. One after another the crew got seasick. Eventually captain Hank himself became incapacitated by mal-de-mer and ordered John to take the wheel and hold the little ship steady. John stood on the deck in his yellow foulies, lashed to the rails of the wheelhouse like Ahab strapped to the whale. He was petrified by the force driving the ship into the waves. Spray stunned his face and streamed over his glasses. You forget your fears and you get high on your performance. As the sea rose before him, he shouted back in defiance, singing shanties, sailor’s songs and old ballads he had heard in Liverpool. The experience was life changing for John Lennon and after arriving safely in Bermuda on the 11 June 1980, he inscribed an entry in the ship’s logbook . 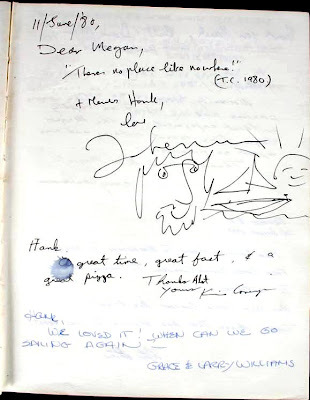 “Dear Megan”, he wrote, “There is no place like nowhere”, and added a doodle of himself and the “Megan Jaye” at sunset..